Curling irons can be very useful for locking luxurious waves or springy curls into otherwise straight and lifeless hair. However if you don't choose the right tool or neglect to use it properly curling irons can actually leave your locks looking dry, damaged, and brittle instead of soft, shiny, and full of body. The exact curling iron model you choose will depend on your hair type and the style you want to achieve. However, by focusing on a few curling iron basics you can narrow down your shopping choices. Barrel Size- Choose the length and diameter of the curling iron's barrel carefully. For small curls choose a small, less than ¾ inch, barrel. For bigger curls or waves go with a 1 ½ to 2 inch barrel. If you have long hair you will need a longer barrel so that hair can rest evenly over the heat. Barrel Plating- The plating of a curling iron barrel is usually available in three different materials. Chrome, gold, and ceramic. Chrome plated barrels are the most common and least expensive. However, this material is really only effective for easy to curl, otherwise healthy hair because the heat is not always distributed evenly and the material may snag hair strands. Gold Plated- Are great for individuals you plan to use the curling iron daily. This material helps distribute heat more evenly, is less likely to scorch the hair strands, and provides a smoother surface that eliminates hair strand snags. Finally, ceramic barrels are perfect for curling frizzy, colour-treated, damaged, dry, or hard to curl hair. The ceramic material helps seal the hair cuticle and lock in moisture during the heating process. This material also provides even heat distribution and more regulated temperature control. Heat Settings- Always choose a curling iron with a wide selection of temperature settings. For fine hair, easy to curl hair, or slight waves you will need a low temperature setting. For hard to style, coarse, or long hair you will need a much higher temperature. By having a few choices in heat range you can modify the curling iron to your particular hair type and style choice. Safety Feature- No matter what hair type you have or style you are going for you will want a few key safety features on your curling iron. Look for an iron that features an automatic shutoff in case you forget to unplug the unit, a ready light indicator so that you know when the tool is safe and ready for use, and a swivel cord so the unit won't come unplugged during use. Also look for a heat resistant, comfortable handle to help you keep your grip during styling, and a safety grip on the end of the barrel to prevent accidental burns. Once you have purchased a safe and effective curling iron you need to know how to use it properly. Never curl wet hair. The heat from the curling iron's barrel will turn any surface moisture into steam, which can burn the hair strand or skin. Never leave the heated barrel in contact with hair strands for more than 8 seconds. Prolonged contact with direct heat will weaken the hair strand resulting in breakage and split-ends. Never apply heat directly to the roots of your hair. 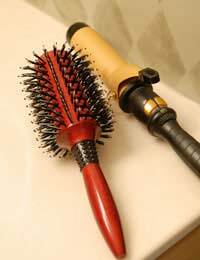 Keep the barrel of the curling iron at least ½ inch away from the hair roots to avoid skin burns and cuticle damage. Always separate your hair into small sections before wrapping around the iron's barrel. Big, thick sections of hair will take longer to curl thus increasing the time needed for contact with direct heat. By working in small sections you can quickly set the right amount of curl without increasing hair strand damage. Never brush, comb, or pull on hair strands immediately after heating. Make sure that the curls are completely cool before you style them. While your hair is still warm it is more prone to breakage and damage. By following the tips above and strictly adhering to the curling iron manufacturer's instruction you can safely achieve your curly style without compromising the health of your hair.